Most folks are trying to put the 2018 growing season behind them, especially with the abnormally wet, hurricane-ridden, and drawn-out harvest season. 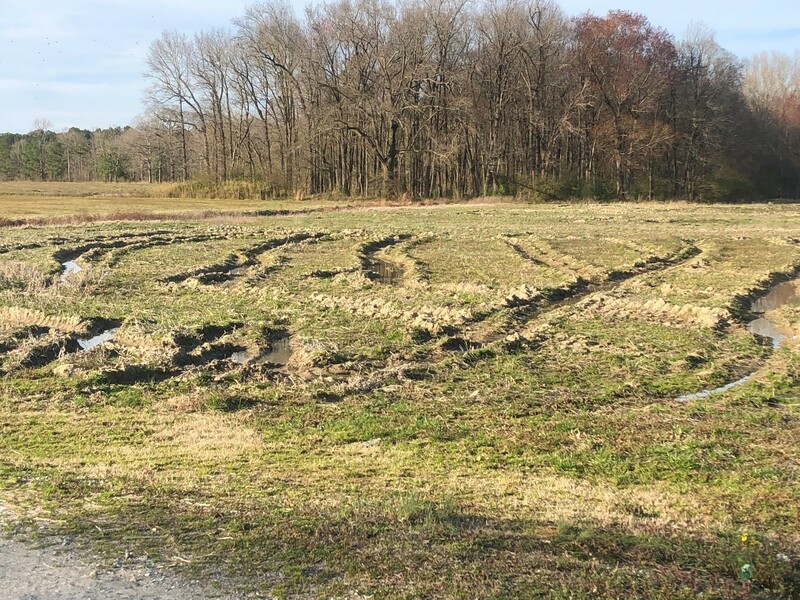 However, traveling around the state this extension season, we’ve observed many ruts which serve as a constant reminder of the challenges faced during 2018, and are now carrying into 2019. With a welcome break in rain, many folks will be out trying to erase these ruts. While you are out enjoying some tractor therapy this spring, we want to remind you of a few effects tillage can have on weeds. First off, we need to recognize a great resource where some of this information was gleaned. The great group of weed scientists in the mid-Atlantic recently published the Integrated Weed Management Guide for Mid-Atlantic Grain Crops. The overall purpose of this guide is to provide farmers with practical information about effective weed control tactics and their place in IWM. A common scene across the state, ruts resulting from a wet harvest season. Back to field repair and the potential effects on weeds. Prior to Roundup Ready technology, tillage was instrumental for weed control. Primary tillage was used prior to planting to destroy weeds by chopping them into small pieces or burying seeds. If you recall, large weeds or weedy patches required more aggressive tillage (moldboard plow) or multiple passes from a less aggressive implement. However, most moldboard plows are planted in the woods collecting rust. Most field repair will be done with one pass of a disc harrow or turbo-till (where ruts are shallower), just enough to smooth out ruts. Although, these implements are convenient for field repair, some weeds may survive just one pass. We have all seen fields of bolted horseweed survive even two tillage passes. With that in mind, we have a few things for you to consider while you are out erasing ruts from last year. Because we just got back in the field, many burndown applications will coincide with field repair. Our most popular burndown herbicides this time of the year are Roundup and 2,4-D, both of which are systemic (translocated through plant). Due to their systemic activity, these herbicides need time to be translocated prior to weeds being disturbed by tillage. In most situations, we recommend waiting 2 to 3 days after applying Roundup before performing tillage. If you are dealing with larger weeds and/or perennial and biennial weeds, you may want to consider waiting longer. If you are using paraquat (Gramoxone), tillage 1 day after application should suffice. What if you perform tillage before applying burndown herbicides? In this case, wait until weeds recover from tillage and begin to regrow before spraying your burndown. This could range 7 to 10 days after tillage. We strongly recommend a residual herbicide with Roundup and 2,4-D applied burndown, mostly for horseweed yet to emerge and early season common ragweed and Palmer amaranth control. Remember, tilling after a residual herbicide has been applied will fracture the herbicide zone and disturb residual activity. While tillage can be useful for controlling weeds, it can also stimulate weed seed germination. Tillage may bring weed seeds to the surface where they can easily emerge. Moreover, some weed seed, like Palmer amaranth, need a flash of light to initiate germination, which is unavoidable if performing field repair. Many of the pigweed species also have a dormancy mechanism called a hard seed coat. Abrasion caused by tillage can damage these hard seed coats and initiate germination. Keep in mind, you may have more weeds to deal with where you perform tillage to repair fields. In a perfect world, burndown plus residual herbicides are applied after field repair, ensuring the herbicide is left undisturbed by tillage. However, it may be necessary to burndown before fixing ruts. If you are planning to split your burndown, it would be best to apply your POST products of choice before tillage, and following field repair, apply your residual herbicide to minimize disturbance. However, take into consideration how plant-back intervals vary by tillage system. For example, cotton planted no- or strip-till can be safely planted 14 to 21 days (at least 1 inch of rainfall/irrigation required between application and planting) after flumioxazin (Valor SX). However, the waiting period is extended to 30 days if cotton is planted into conventional tillage land. With that said, don’t let this discourage you from repairing fields. Just remember, like Newton’s Third Law (for every action, there is an equal and opposite reaction), tillage is necessary for erasing ruts but can also affect weeds and weed seeds. Do not let these patches serve as further reminder of the challenges during 2018; plan accordingly.